Dianne Spitalny is principal flute of The Chappaqua Orchestra, a founding member of TCO Winds and Northern Westchester Flutes. She has performed with the Norwalk and Stamford Symphony Orchestras, the Metropolitan Wind Symphony of Boston, and the Sherwood Woodwind Quintet as well as, the Northern Pennsylvania Philharmonic and the Taconic Opera. She taught instrumental music in the Chappaqua Central School District and maintains her own flute studio where she teaches students privately. Dianne teaches a Flute Ensemble class helping flutists discover the joy of playing in a flute ensemble through Chappaqua's Continuing Education program. 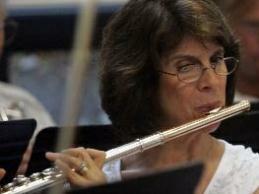 She currently performs with The Chappaqua Orchestra often as a featured soloist. Ms.Spitalny is also a member of TCO Winds; Northern Westchester Flutes; and, the Spianato Winds. As a soloist or as part of one of her many small ensembles, Dianne often plays at weddings and other intimate gatherings. She was recently featured in The New York Flute Club's Newsletter. Dianne received her Bachelor of Music degree in music education from Ithaca College and a Master's degree in performance from the New England Conservatory of Music. She has studied with Paula Robison, Murray Panitz, Samuel Baron, John Heiss, David Berman and James Pappoutsakis. Dianne has taught in the New York, Massachusetts and New Jersey public schools and has served on the faculty of the Westchester Conservatory of Music, Marymount College and the Center for Chamber Music in Greenwich, Connecticut.